What is a wireless home security system? A wireless home security system like Ooma Smart Security uses a combination of wireless sensors, security cameras and your iOS or Android device to provide home security and monitoring throughout your home. This kind of setup makes home security more affordable as well as flexible to your home's specific security needs. Choose where you want to place your sensors/cameras based on your specific home's layout and security needs. Pair your cameras and sensors with the Ooma Home Security app, and select your notification settings. Start monitoring your home. No wires. It's really that easy. Wireless home security systems are great for renters and homeowners alike since the sensors are easily removable - you can take them with you to a new home or apartment if you move or relocate, for example. 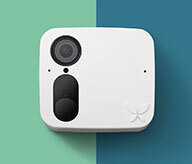 In addition to a variety of wireless sensors, Ooma Smart Security offers Ooma Smart Security Cam, a home security video camera with facial recognition technology that can identify family members, friends and even pets from unknown visitors. How to keep your kids safe with home security systems. 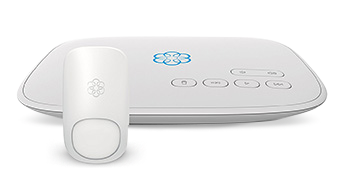 What kinds of sensors are included in the Ooma home security system? How do wireless home security systems work? Why does Ooma Smart Cam use facial recognition? Are wireless home security systems safe? Home phone and do-it-yourself home security service. 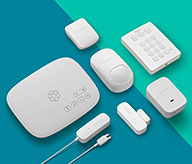 The starter kit includes Telo and Motion Sensor.